President Petro Poroshenko held telephone conversations with Secretary of State Rex Tillerson on Saturday, November 4. This is reported by the official website of the head of state. Poroshenko and Tillerson discussed the situation in Donbas, including the deployment of UN peacekeeping contingent in the conflict zone. "The interlocutors coordinated further steps for the deployment of the UN international mission in the occupied part of Donbas, including the uncontrolled section of the Russian-Ukrainian border," the report said. The President also focused on the need for the United States to continue the sanctions policy towards Russia. "The head of state noted the importance of sanctions against Russia, noting that only in this way can the aggressor would be forced to return to the mainstream of international law, respect for the sovereignty and territorial integrity of states," the message said. 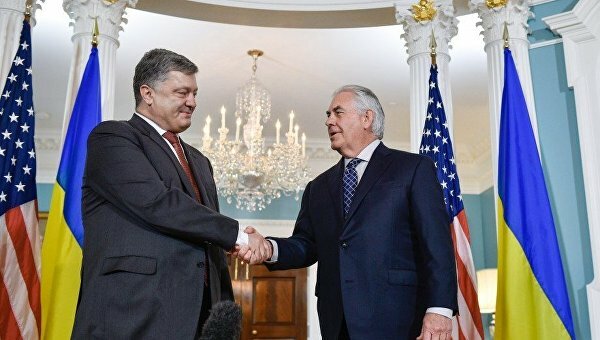 Poroshenko also discussed with the US Secretary of State the issues of bilateral cooperation between Ukraine and the United States, informing Tillerson about the course of Ukrainian reforms.